Color Me Katie: Happy Birthday, Blog! Color me Katie turned 1 year old this week! I originally started this blog to have a place to put my photos rather than hide them away on my hard drive forever. I thought my only reader would be myself but now a year later I've had almost half a million visitors, crazy! So thank you my sweet readers, for following along on my silly adventures, making your own fun versions of my projects, sharing your stories with me, and for your constant love and support. I feel like I have thousands of best friends that I've never met. HAPPY BIRTHDAY! I've followed this blog for about a year and it's my favorite! Your pictures are amazing and SO inspiring! Thank you so much for sharing with everyone! How much time do you have to do individual photo shoots? Next time I come to New York (hopefully SOON) I would love to take pictures with you. What do you charge? Happy Birthday to my favorite blog! Thanks Katie! I don't have any questions for you! I have enjoyed learning little things about you through your photos and project w/Mattie. A Very Happy Blogging Birthday! I discovered you about 4 months ago through The Happiness Project, which I had read about in a magazine (remember those?!! )..one thing led to another. Now even I have a blog, and I'm the most non-techy person ever!! You have been an inspiration to me, and you've never failed to cheer me up on sad days. For that I'm so grateful. I look forward to seeing many more of your vibrant, fun, happy and creative photos. Keep up the excellent work, Katie!! Say hi to Moo for me. CONGRATS!! You success is amazing and inspiring! Here's to another fantastic year! Happy birthday! I absolutely love what you do, you give me and countless others so much happiness with your cheerful posts! I would like to know how you manage to get your cat in the car. If I tried that move I would end up in the ER!! Felicidades! Your blog is amazing!! Happy Blogger Birthday! You truly are a blog success story. I found your blog on one of my first days exploring Blogland. You always make me smile! Hi Katie! Happy blog birthday! How long have you and Mattie been dating? And do you guys plan on getting married? You seen like such a perfect couple! Your blog is amazing and it is one of my favourites to read. I am sorry if you have written about this somewhere already but I would like to know where you learned all that you know? ;) I guess what I mean is, where did you learn to be such a great photographer, what schooling have you done, if any? Where on earth do you get your fantastic ideas? I wish I could be so creative! Happy Blog-day. Your blog is inspiring and fun...when I get too into the "seriousness" of life, I like to take a gander here where things are more carefree. It's so fun to see your photography and street art. My question is: how do make so much time in your life for the things that are truly important to you? As a fellow photographer and artist, I would love to know your answer to that question! Happy Blog Birthday! You're such an inspiration to me. Whenever I'm feeling down I can always count on you to make me smile. My only question is a request..if Moo still has his boy bits and if he ever has kittens, can I have one? See, I want to steal Moo but I know what that would do to your heart. Happy Blog Birthday, Katie! Your words and photos are always a treat. Keep 'em coming! Question: Which blogs, if any, do you check out for fun / inspiration? Happiest blog birthday! Yay for you & for having fun!! What can i say? I love your blog, your work is such an inspiration. And every time you ahve a surprise for us. Happy Birthday blog!! I have really enjoyed reading your blog over the past year. I always become so inspired to be more creative and actually do the art projects that are in my head. I look forward to reading your blog for another year. Hooray! I celebrate your blog every day, but Happy Birthday wonderfully happy,heartwarming, spirit-lifting,inspiring and creative Katie's blog! I am eating cake, blowing up balloons, and throwing confetti in your honor right now. My days would not be nearly as bright without you. P.S. I would like a Moo kitten,too. I am a little strange. I would like to know how old you are? And what is your next biggest passion, next to photgraphy? And if you could have any photo session of your dreams...who or what would it be? Good one, eh? How are you so cute? And...do you listen to music when you are brainstorming new ideas? Who are some of your favorite music artists? Happy first year on the blogosphère (can't translate that, I 'm sorry) ! Succes is worth! Happy blog birthday! You deserve your thousands of best friends, you've earned them by making all of us smile, even on our gloomiest days! So what do you do, when you have a gloomy day? Do you ever curl up in bed, with Moo by your side, just sulking? Or do you always find a way to lift your own spirit? Your photos and videos often bring tears (of happiness) to my eyes. Happy Birthday!! !1 Congrats on your awesome blog! happy happy blog birthday lady! and what is your favourite word? happy birthday blog. one of my friends showed me your blog because she liked your creativity - and moo looks loke my kitten Tudur. My question is, did you start taking moo out with you in a bag since when he was small? It would fun to take Tudur on some adventures too. Congratulations with your blog! U are indeed a fascinating woman, and I love reading about ur life! I've been wanting to ask you, did you go to photography school? I really want to become a professional photographer but I don't live near any photography/art schools. Do you have any advice? happy bloggie birthday! yours is truly one of my favorites and i find you and your projects so very inspiring so thank you! Happy Birthday to your lovely blog! Every time I see a new post from you on my dashboard feed, I click it immediately. It always brings a smile! Congrats and keep up the amazing blogging! I found your site in May and it really picked me up at a very difficult time in my life. Ever since, I've been coming back for my weekly (sometimes daily) dose of inspiration. In fact, it's sites like yours, (e.g., The Happiness Project, Awake@thewheel, Shutter Sisters) that got me to start my own blog (http://owningkristina.wordpress.com). I'm a mostly melancholic girl, but your blog always puts a smile on my face, so thank you!!! and happy birthday!!! I'd like to ask (if you ever get sad) what makes you sad and how do you get over it? I see my front door in that picture above, haha! Happy birthday blog! Congrats! I just found this blog yesterday from an Improv Everywhere link! Happy birthday to your blog!!!!! Katie, I want to thank you so much for sharing your life so openly. You are one of my biggest influences. I try to check your blog whenever I'm on the computer, and every time I do I am inspired to live my life in a more compassionate, spontaneous, and meaningful way. You and your art and your unique approach to life make me so happy. and what's a favorite encounter with a stranger you've had? Happy, Happy Blog Birthday!!! Your blog is always an inspiration to me...every single time I come over here!!! I really look forward to reading what you have to say...or checking out your latest pics...thanks so much for being my creative inspiration!! Hugs! color me katie is one of the most joyful blogs i know. 1. if you could do anything you wanted without the possibility of failure, what would you do? 2. what's your favorite ice cream flavor? What is your favourite piece of classical music? Thank YOU for the time and energy you put into your blog - it brightens my day. Happy birthday Color Me Katie! Happy blog birthday! Thanks for brightening up our world via blogosphere. Do you think you'll come visit New Zealand one day? woof woof woof woof woof? Which blogs do you get inspired by? :) happy birthday! Happy birthday Color Me Katie, happy birthday to yoooooooooo! I am curious to know how your childhood influenced your bohemian outlook on life. I live in a society that prizes pure academic excellence and marginalises artistic creativity - and I really hope that despite the pressures here, my son will still grow up to appreciate the beauty in small things. You are so awesome Katie :D :D :D.
Happy Birthday to colormekatie with all my heart :). You are a huge inspiration in my life ever since I've stumbled on your blog :) :) :). My questions: When was the best day in your life so far? What happened on this day :)? And do you know Mike Leigh's recent wonderful movie Happy-Go-Lucky ;)? You share some qualities and traits with it's main character Poppy, played by Sally Hawkins, I'd say :D :D :D.
happy birthday! it's so great that you have so many followers because your blog would be so sad if it wasn't read. Yay Katie! It's ve been a year already! Congrats! I adore your pictures and your optimism! My question: How did you become photographer? And such a lovely one! I've been watching your blog forever and always meant to comment, so, Happy Birthday! You are awesome!!! Happy birthday! What is your best childhood memory? This is my favourite blog by far! Your creativity inspires me! HAPPY BIRTHDAY COLORMEKATIE! I'm such a huge fan of this blog! I just wna know what kind of music do you like/listen to? What is your favority color? You are showing my kids what it means to be fun in ways that don't cost a lot of money. And, AND, making strangers smile, laugh, and feel good about LIFE. You are showing me that as well. Oh, ever been to West Virginia? It's wild AND wonderful! not really a question, but I always wonder where you got all these creativeness from! I love how you put whatever inspirations you get into work, and not just store them away. your photos are simply amazing! Hi katie! I was wondering, do you have a favorite book or movie? and also, what is your favorite smell in the world? I love the smell of baking cinnamon bread. yummmmmm! You color my day everytime I check your blog. Q: When will you have your first colormekatie book in stores? Happy birthday, Color Me Katie! I have a question, but if it's too personal don't worry about it. How do you afford your life? I'm an aspiring photographer/graphic designer but I got stuck at a desk job I hate when the recession and budget cuts took away my old job. I can't afford my bills without my terrible desk job, so I was wondering what financial advise you'd give to an aspiring photographer. Thanks! Katie--you have sooo many loyal readers because what you do is so amazingly awesome and inspiring. Everytime I read your blog I have a smile on my face. Keep doing what you are doing! Where do you get all of your ideas? I mean, most of mine appear when I'm in the shower (I have no idea why). Do you have a place where inspiration arrives or is it more of a spontaneous thing? And can you post more Moo pictures? He's just too cute. I found your blog when i moved across the country and was super depressed and homesick! !I absolutely love it, it inspired me so much and got me smiling again!!! Thanks a bunch!! Also I told my best friend about it and she actually said you two went to high school together! Small world huh!! Her name is Rachel Klein, she says a big hello!! how can i see some of the answers to other people's questions?? do you put your pics on external hard drives to save them all, or a million disks? my computer is starting to function so slowly because all my pictures are taking up too much space!! my question: i'm fairly certain that you are inspired by almost everything, but what are 3 distinct things (people, places, objects, etc.) that inspire you? Happy Birthday, Color Me Katie! Love your blog! 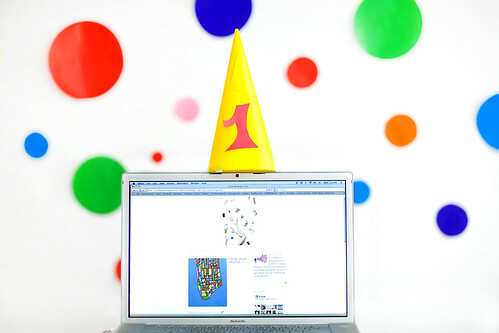 Happy 1st year to the blog !! Woooo,a D&A post would be so much fun !! What camera/cameras do you use ?? And what are the things or people that you love to photograph everytime ? Happy blogiversary! How surprised was I to see the pigeon made it up there! I'm glad you liked it, it was fun to make. Keep up the good work! And thanks again for being so inspiring! And woah, you even put two of our pictures into your collage! Haven't answered your email , but we were quite happy that you had time to answer ours. 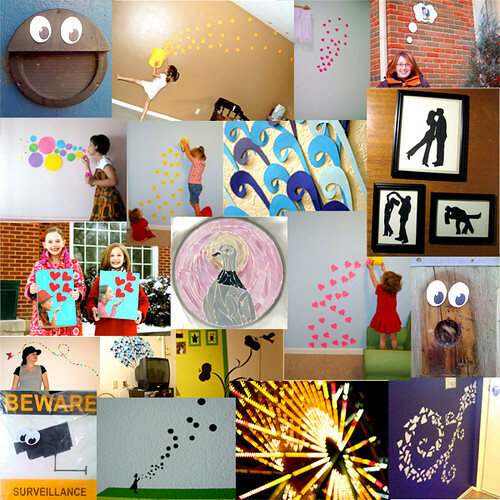 So cheers to many many more colorful posts and years of this blog! Your creativity has inspired me in my senior drama classes - you help make me want to be a more creative teacher to my students and I thank you for it. Thank you for your 'color' each day! If you ever do see this question, do you make enough to save for the future and spend for the present? You inspire me greatly, but I live in a society where following one's inspiration and dream seems almost impossible if the regular standard of living is to be kept. Thanks for all the inspiration. I'm chuffed to see some of my photos there. Sticking silly eyes to inanimate objects was some of the most fun I have ever had while photographing. The smiles of passers-by made me very happy. Thanks for making the world a happier place. Congrats - what you do is amazing. meow mmme me meow meow? My Saturday morning routine involves visiting my fav arts and crafts blogs - yours is one of the first ones I check out. Your happy posts keep me smiling! Thanks for sharing your adventures! The tiny traveler was created, thank you for being so inspiring. I'd say more but they said it already. did your gramma give you your spirit! ?